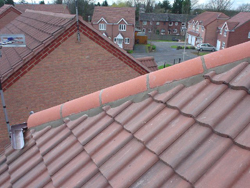 We are approved roofing contractors for the “Help line” service of Insurance companies and Building society’s. We will submit estimates – do any emergency work and complete the job all at competitive rates. UPVC Soffits – Fascias – Cladding. Storm Damage 24hour Emergency call out. Insurance & building society work undertaken. Guttering Complete replacement service or repairs. 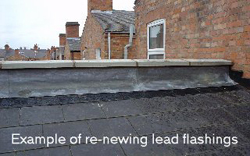 Roof repairs – Leaks – Slates – Tiles. Flat roofs Renewed and repaired. Lead Valleys Replaced and repaired. Ridge tiles Re-pointed / Re-bedded chimney pointing. Gable ends pointed / Re-bedded. 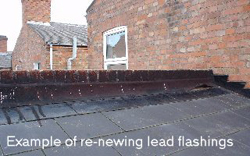 Example Of Replacing Old Lead Flashing’s With New Lead Flashing’s. 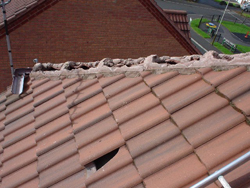 Example Of Replacing Missing Ridge Tiles And Broken Tiles. After the old mortar has been removed and the damaged tiles are replaced a fresh bed of strong mortar is applied and the ridges re-bedded one at a time.